“There really isn’t any department within a university that can’t find something specific in the book that relates to it,” Rebecca Skloot pointed out in the NPR interview, “whether it’s law, women’s studies — it really does cross all of the different boundaries. And one of the things that I hear over and over from students and from teachers is not that it just touches all the disciplines, but it touches every student personally. Read a synopsis of NPR’s interview with Rebecca Skloot. 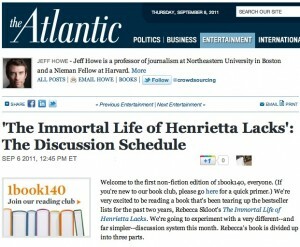 Listen to the podcast of NPR’s interview with Rebecca Skloot. 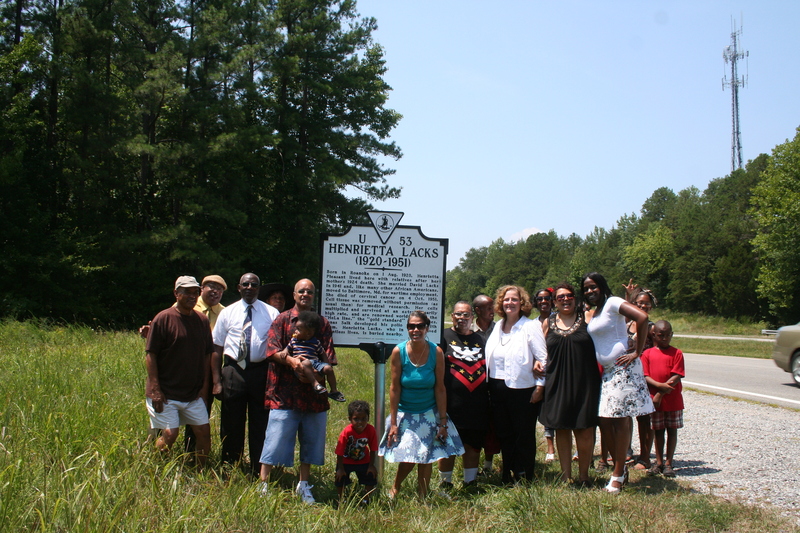 Henrietta Lacks historical marker dedication ceremony in Clover, Virginia. In addition to the general community, guests of honor included some of Henrietta Lacks’ children and grandchildren. Henrietta’s sons, David “Sonny” Lacks and Zakariyya Bari Abdul Rahman at the marker site honoring their mother. 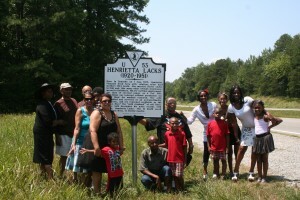 Henrietta Lacks’ family members, including her children and great-grandchildren at the historical marker site. 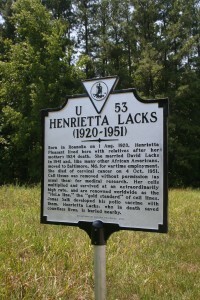 The historical highway marker, honoring Henrietta Lacks and her contributions to science. 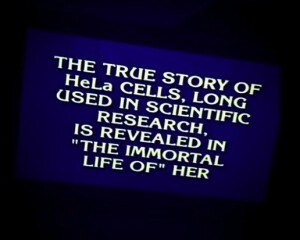 On July 29, 2011, The Immortal Life was a “double jeopardy” question on the TV Quiz Show Jeopardy!. Rebecca Skloot was flooded with emails, tweets, and phone calls from people who saw it and shouted out the answer at home. Perfect for reading groups and classrooms! 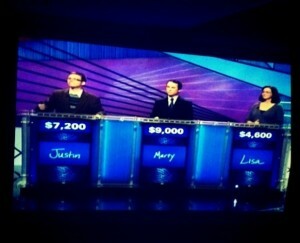 Check out this reader-generated online Jeopardy! game – you can play with up to 12 teams. Rebecca Skloot has been named the winner of the 21st Century Award, given by the Chicago Public Library and the Chicago Public Library Foundation as part of the Carl Sandburg Literary Awards. The award recognizes a Chicago-area writer for recent noteworthy accomplishments. Author Rebecca Skloot and film critic Roger Ebert will be honored at the Oct. 20 Carl Sandburg Literary Awards Dinner, the Chicago Public Library and Chicago Public Library Foundation announced Tuesday. 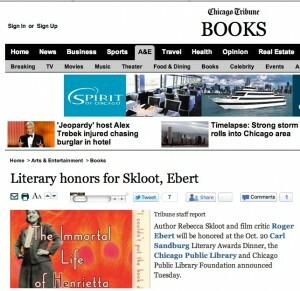 The Chicago Sun-Times’ Ebert will be given the Carl Sandburg Literary Award, while Skloot will receive the 21st Century Award. The latter award recognizes a Chicago-area writer for recent noteworthy accomplishments. “We sincerely believe that Rebecca Skloot’s profound book, ‘The Immortal Life of Henrietta Lacks,’ and her other wide-ranging writing in the sciences make her one of the more important writers working in Chicago today,” said Library Commissioner Mary Dempsey. 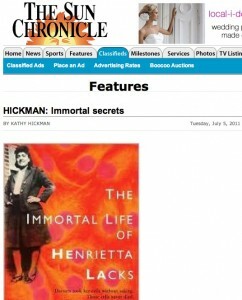 The Immortal Life of Henrietta Lacks is being translated into more than twenty-five languages. Each international edition has its own unique cover, and we’ve gathered many of them on the new Translated Editions page of Rebecca Skloot’s website. We invite you to check out the various cover treatments – it’s fascinating to see different designs created by publishers from all over the world. Both the UK hardback and paperback of The Immortal Life depended strongly on what first drew me to the book as an editor: The lost story of an extraordinary woman. In that sense, my objective was to make both editions almost have the feel of a detective story, with a strong sense of time and place. Who is this woman? Why is she important to all of us? To give a sense of 1950s America, we commissioned an incredibly talented typographer called Stephen Raw to create customized lettering for the title. That lettering, which appeared on both UK editions, very cleverly hints at 1950s book jackets, but also has a very human, hand-cut feel; it shows that the book has warmth, and soul. For the paperback, our head of design, James Annal, came up with the smart idea of making the whole cover a literal ‘whodunnit?’ (or even, ‘whoisit?’): a silhouette of a woman in profile. It’s graphically very pleasing, but also captures so much of the book’s essence, I think: of absence and obscurity, and lost voices – of loss, full stop. The book has such a beautiful title that with this image, we hope that a reader can’t help but pick the book up and ask: who is Henrietta Lacks? Rebecca’s writing does the rest…. 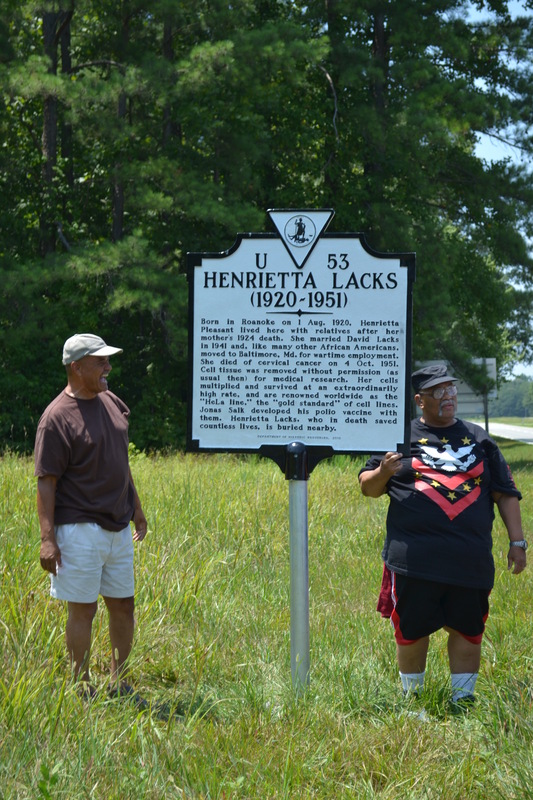 A new state historical highway marker honoring Henrietta Lacks will be dedicated by the Virginia Department of Historic Resources on July 29, at 11 a.m., near her childhood home in Clover, a rural community in Halifax County. The dedication ceremony will be at St. Matthew Baptist Church in Clover. The Honorable William A. Hazel Jr., Virginia Secretary of Health and Human Resources, will provide keynote remarks. RICHMOND, VA – An historical highway marker honoring Henrietta Lacks, an African-American woman whose legacy to medical science was the first line of “immortal” human cells, will be dedicated by the Virginia Department of Historic Resources later this month near her childhood home in Clover, a rural community in Halifax County. The “Henrietta Lacks” marker will be dedicated at 11 a.m., on Friday, July 29, at St. Matthew Baptist Church, located at 1164 Clover Road, in Clover. Virginia Secretary of Health and Human Resources Bill Hazel will provide keynote remarks during the ceremony. Others participating in the event will be Kathleen S. Kilpatrick, director of the Virginia Department of Historic Resources; Clarice Buster, of the NAACP, Halifax County Chapter; Rev. Frank E. Coleman, pastor of the First Baptist Church in South Boston, and Rev. Alfred L. Chandler of St. Matthew Baptist Church, which is hosting the event. Guests of honor at the ceremony will include some of Henrietta Lacks’ children and grandchildren from Baltimore and elsewhere in the country. A public reception in the church’s fellowship hall will be hosted by the Department of Historic Resources after the ceremony. 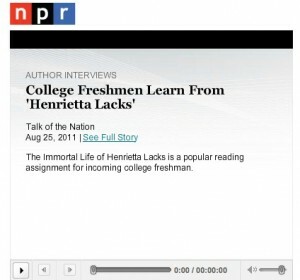 Since 1951, the year Lacks died of cancer, HeLa cells have been crucial to important research resulting in “the polio vaccine, chemotherapy, cloning, gene mapping, [and] in vitro fertilization,” writes Rebecca Skloot, author of “The Immortal Life of Henrietta Lacks,” a book published in 2010. Although HeLa cells are responsible for great advances in medicine, the taking of the original tissue sample without Lacks’ consent — during an era of Jim Crow segregation when medical experimentation on African Americans was covertly practiced — and subsequent developments raise important ethical issues. 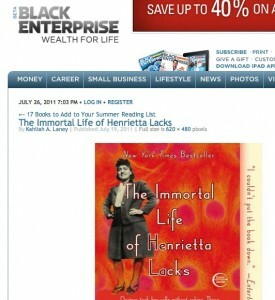 For instance, while many have profited from the multi-million dollar industry resulting from the packaging and sale of the HeLa cells, Henrietta’s family members never benefitted financially from them. Skloot’s critically-acclaimed book chronicles the Lacks family’s difficult and painful struggle to learn more about the cells after being informed in the 1970s of the HeLa line’s existence, 20 years after Henrietta’s death. At the heart of that story are many legal and ethical questions of growing importance today concerning what rights we have as individuals over our own biological material. “The story of Henrietta Lacks and the development of the first ‘immortal’ cell line encapsulates so many issues,” said Secretary Hazel. “It touches race, education, poverty, and medical ethics, and demonstrates not only how much progress has been made but how difficult these questions are. The good news here is that her unknowing contribution has helped many people around the world,” he added. 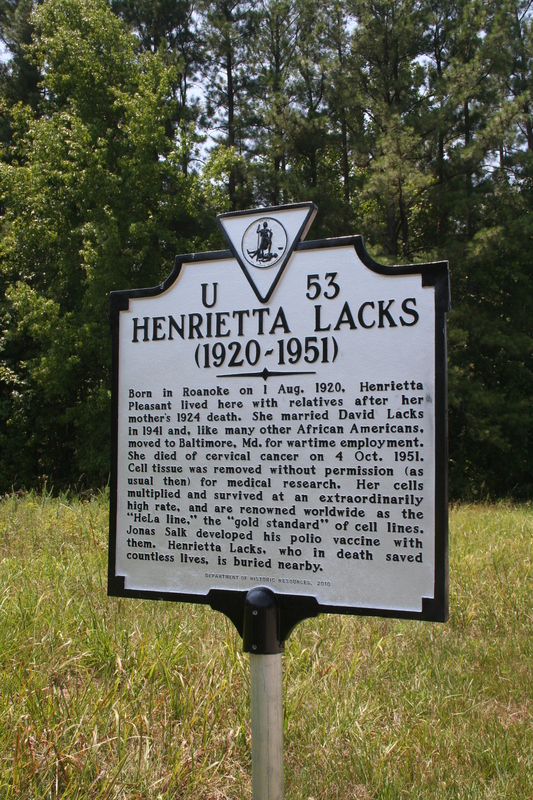 The Henrietta Lacks marker was approved by the Virginia Department of Historic Resources at its September 2010 board meeting. It was sponsored by the department as part of a decade-long program to create and encourage new markers that highlight important events, people, and places in the history of African Americans, women, and Virginia Indians that have contributed to Virginia and the nation’s history. 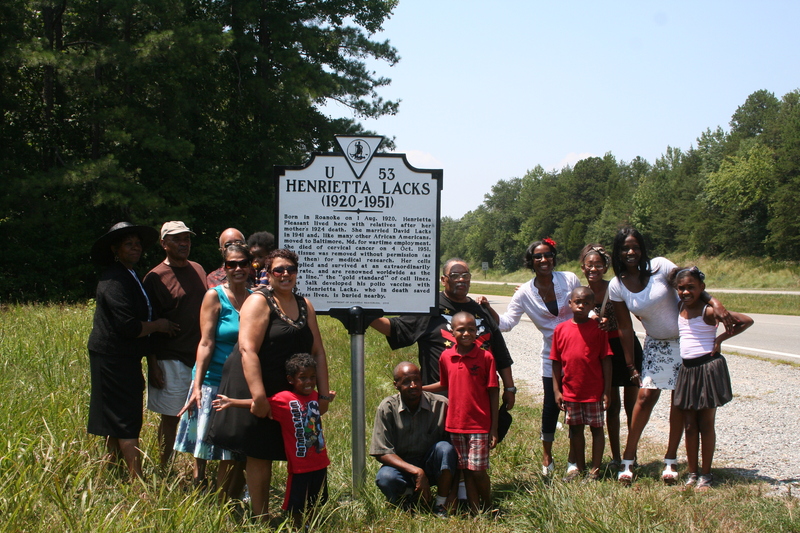 “The Lacks Family thanks the Virginia Department of Historic Resources and all who took part in creating the historical highway marker to honor Henrietta Lacks,” said Jeri Lacks Whye, on behalf of the family. 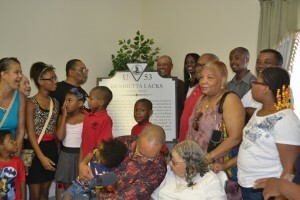 “This marker will be another outlet for educating people about a phenomenal African American woman who touches the lives of many in astonishing ways,” added Whye, who is the daughter of Henrietta Lack’s son, Sonny Lacks. Virginia’s historical highway marker program, which began in 1927 with the installation of the first markers along U.S. Route 1, is considered the oldest such program in the nation. Currently there are more than 2,200 official state markers, most of which are maintained by the Virginia Department of Transportation, a key partner with the Department of Historic Resources in the historical marker program. Born in Roanoke on 1 Aug. 1920, Henrietta Pleasant lived here with relatives after her mother’s 1924 death. She married David Lacks in 1941 and, like many other African Americans, moved to Baltimore, Md. for wartime employment. She died of cervical cancer on 4 Oct. 1951. Cell tissue was removed without permission (as usual then) for medical research. Her cells multiplied and survived at an extraordinarily high rate, and are renowned worldwide as the “HeLa line,” the “gold standard” of cell lines. Jonas Salk developed his polio vaccine with them. Henrietta Lacks, who in death saved countless lives, is buried nearby. For a PDF of this press release, visit the Virginia Department of Human Resources website. 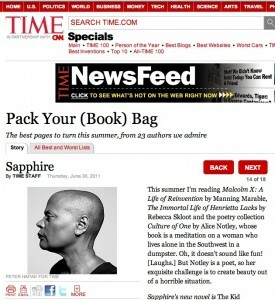 Time magazine’s Pack Your (Book) Bag feature (“the best pages to turn this summer, from 23 authors we admire”) reports that bestselling novelist Sapphire (author of Push, which was turned into the Academy Award-winning film Precious) is reading The Immortal Life.